The first meeting of what became La Societé Internationale d’Oncologie Pédiatrique (SIOP) was held in Madrid on November 6–8, 1969. It was the outgrowth of Le Club d’Oncologie Pédiatrique formed in Paris (see Introduction). The 15 founders of SIOP, part of the original document. The Madrid meeting was very productive. Statutes were adopted and dues and membership requirements were established. All branches of the pediatric health sciences were eligible for membership, for example, surgeons, pathologists, and radiation therapists whose primary professional activities were focused on childhood cancer. Nineteen founding members (Les membres actif) were elected (Appendix B). Dr. Odile Schweisguth was elected the first president. Dr. H Plüss of Zürich was was named as the Treasurer, and Dr. Schweisguth’s able assistant, Dr. Jean Lemerle of Paris, became the Secretary. The stability and enduring history of SIOP is in no small measure due to the dedication and commitment of Dr. Lemerle and his countrymen and women. Subsequent meetings furthered the plans made in Madrid. They were held in various European cities at first, but eventually—reflecting the increasingly intercontinental membership—bids from various other continents were entertained. Two themes were to be selected for each year’s meeting. Medulloblastoma (MBL) and nephroblastoma were the two selected for the second meeting, scheduled for Lyon on October 9–11, 1970. The pattern for SIOP meetings took shape where the Treasurer gave his report. The SIOP bank balance was 1,292 Swiss Francs as of October 10, 1970. (Union Internationale Contre le Cancer) were also initiated. The idea for a pathology panel probably arose during the first SIOP meeting in Madrid in 1969. There the pathologists Drs. 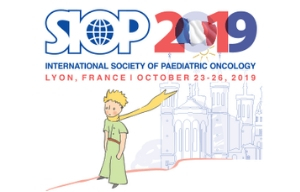 Rémy Gerard- Marchant of the Institut Gustave-Roussy, Paris, and Jan Delemarre of the Antoni van Leuwenhoekhuis Hospital, Amsterdam, agreed to review the slides from the SIOP-1 nephroblastoma trial when it was initiated in 1971. Both were energetic, very experienced pathologists. Rémy had served as a young doctor in French Indochina, which he used to describe as a paradise before the wars. He had a big moustache and always appeared in a polo shirt and club blazer. At the review sessions, he complained that preoperative (pre-op) therapy impeded a detailed assessment of the intrinsic tumor pathology. His great experience encompassed all types of “solid” pediatric tumors as well as lymphomas. Jan was the very nice, kind, and calm Chairman of the Pathology Panel. He took care of the paperwork and all practical matters during the early SIOP studies, setting the pattern for the Panel’s work in the future. Dr. Bengt Sandstedt of the Karolinska Hospital, Stockholm, was invited to join the pathology panel in 1971.Hehad previously reported, together with Dr. Berta Jereb, the prognostic significance of certain histologic features of nephroblastomas, especially, the presence of blastema and anaplasia. Tumor Registry. As the only smoker on the panel, he wafted the nice aroma of pipe tobacco as well as words of wisdom. Fresh blood next came into the panel in 1986 with the young, energetic Dr. Gordan Vujanic from Belgrade. He had studied renal tumors in depth with Jan in Amsterdam. When he later settled in Cardiff, Great Britain, he became the panel’s invaluable secretary and spokesperson. 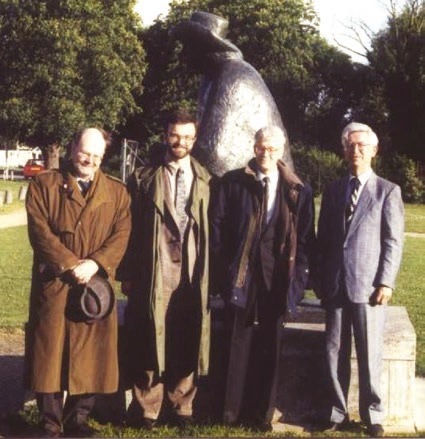 Panel meeting in Amsterdam 1990 with members after Rémy Gerard-Marchant had left. From left: Dieter Harms, Gordan Vujanic, Bengt Sandstedt, and Jan Delemarre. The panel meetings in those days were always held in Amsterdam at the Emma Kinder Zuikenhuis or the Antoni van Leuwenhoekhuis Hospital. Our work rooms were well equipped with microscopes, sandwiches, and beer(!). Dr. Jan de Kraker, then a resident pediatric oncologist, later told us that he had been ordered by his boss to bring enough beer for these important pathologists. One might wonder about the diagnostic quality of the work, but the classification and staging were simple in those days. This was mainly because of the paucity of slides submitted per case, a problem SIOP shared with other studies. The panel also had to contend with the changes caused by the pre-op chemotherapy (CT) that reduced the amount of viable tissue. Initially considered a drawback, it turned into an advantage; it revealed the response to pre-op CT and could be used as a prognostic factor. This and the various types of viable components were registered and analyzed with respect to clinical outcome. The results of these efforts eventually served as basis for the Stockholm Working Classification of Renal Tumors of Childhood. At the annual SIOP meetings, the local pathologists had often arranged separate meetings for the panelists since pathology was a minor part in the SIOP Congresses. Another rescue avenue for a pathologist was to join the social program with the handful of accompanying wives. a close and friendly family. overcome, and Dr. J. Bloom of London in 1972 proposed an MBL trial based on the one underway in the United States designed by Dr. A. Evans et al. entrusted with this responsibility. The first of three editions of the SIOP text shortly appeared. 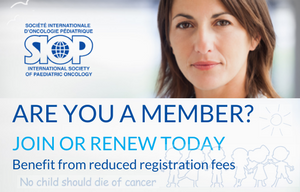 The UICC acknowledged SIOP and the SIOP statutes were revised in the 1970s to make changes in the membership requirements and definitions. The official language of SIOP was changed from French to English in the 1973 Amsterdam meeting because of the large numbers of non-European who had become members. (IPSO) and the Pediatric Radiation Oncology Society (PROS). Dr. L. Ǻhström of Stockholm remembers that the 1975 meeting there earned a note in the newspaper. It said, “Perhaps the most remarkable new medical organization SIOP is meeting in Stockholm this week.” He also arranged that those attending the meeting could visit the hall where the Nobel prizes are awarded. SIOP was also presented a Swedish crystal gavel. It was to be used by the president to call the business meeting to order. Although meant to be passed on from one president to the next, the whereabouts of the gavel is unknown today. The 1976, meeting in Warsaw was notable in that it was the first held in one of the Eastern European nations. As the host, Professor J Bozek said, “This meeting had special importance for Polish pediatricians because they had the opportunity to exchange ideas and experiences with international specialists.” For the first time, physicians from the then Eastern political bloc could meet freely with their Western counterparts, exchange ideas, and work together for the betterment of children with cancer. Another first: It was there that Dr. R.D.T. Jenkin of Toronto became the first non-European SIOP President. Continuing this trend, SIOP moved to Philadelphia for the 1977 meeting. It featured sessions on the neuropathology of brain tumors, reflecting the fact that the North American MBL trial was chaired by Dr. A.E. Evans who co-hosted the meeting with Dr. G.J. D’Angio. “It was difficult to mount a social program that was unique to Philadelphia,” Dr. Evans remembers. The solution was to have a performance by a band of the Philadelphia “Mummers,” the leader of that group being the grandfather of one of her patients. The 1978, meeting in Brussels was attended by 213 persons, the greatest number of SIOP members and guests up to that point. Lisbon was the site of the 1979 meeting. The host was Dr. Antonio Gentil- Martins, a pediatric surgeon long involved with SIOP. A poster session was introduced for the first time, and it was a great success. Also for the first time, the results of the individual clinical trials were presented in separate sessions. The MBL study was closed to further entries because the relapse-free-survival (RFS) and overall survival (OS) of the CT arm were significantly better. the board were discussed and adopted. on the soft-tissue sarcomas and their classification. Those deliberations were the forerunners of the definitive sessions held during the Venice meeting in 1985. The 1983 meeting was held in York. For the first time, the theme of the sessions was the psychosocial aspects of pediatric oncology. Accordingly, nurses, social workers, and psychologists attended the meetings and participated actively. Their presence helped swell the audience to 340 participants plus 40 accompanied persons. To the reports of the research trials were added those of liaison groups to the EORTC and The Late Effects Study Group by Dr. A. Meadows of Philadelphia.